STAR Atlas:PRO is best suited to all current model desktop and laptop computers, however still works perfectly on older computers. Works well on all current model computers. Graphics with 1024x768 or higher resolution recommended. CD-ROM Drive, Mouse or Pointing Device, Optional Windows compatible printer. Optional Internet Connection. Optional USB or Serial (RS232C) Connection for Telescope and DSC connections. Minimum PC configuration (old PCs). Pentium I or faster CPU with Windows 95 or higher. Graphics adapter with 800 x 600 graphics resolution and 256 colours (higher recommended). Up to 2.8 GB of free disk space depending on installation choices (STAR Atlas:PRO Pro-Am Edition). Optional Internet Connection. Optional RS232 Connection for Telescope and DSC connections. My laptop only has a USB port, can I still use STAR Atlas:PRO with my telescope ? If you own a Meade Telescope, you can purchase the USB to RS232 Bridge Cable from Meade or a Meade dealer. If you own a Celestron Telescope, Celestron recommend that you visit a local electronics retailer and purchase a Serial to USB converter. In either case, software is supplied which will set up your computer's USB port as a Virtual COM port and enable telescope communications to proceed via your computer's USB port as if it were a COM port. How do I upgrade to the latest version of STAR Atlas:PRO ? Please visit this page that describes the upgrade policy. Does STAR Atlas:PRO work in the Northern hemisphere ? Absolutely, STAR Atlas:PRO works in the North and South hemispheres. Why isn't there a demo version of STAR Atlas:PRO ? STAR Atlas:PRO is too large of a software package to distribute a demonstration version that would really provide a fair demonstration of STAR Atlas:PRO's capabilities. STAR Atlas:PRO is not one of the packages listed on the Orbital Elements web page at the Minor Planetary Centre. How does one obtain the elements from the Minor Planetary Centre site ? STAR Atlas:PRO readily downloads the Comet Orbital Elements in the MPC Format and does not require any special proprietary format, this is the reason that STAR Atlas:PRO does not have it's own comet file format at the MPC web site. Is STAR Atlas:PRO Australian made and owned? 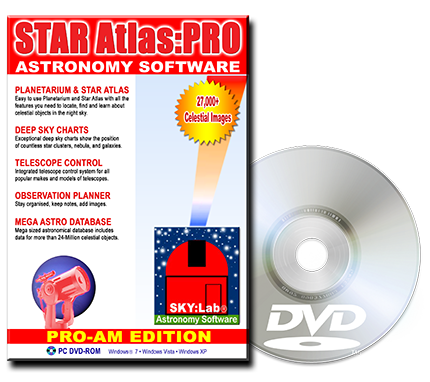 Yes, STAR Atlas:PRO is developed in Australia, by amateur astronomer, astrophotographer, and career professional software developer Paul J. Mayo. It is 100% Australian owned. What Operating Systems does STAR Atlas:PRO work on ? STAR Atlas:PRO runs on all 32-bit and 64-bit editions of Windows from Windows 98 through Windows 10. Can you add your own Astronomical Images ? Certainly, you can attach as many Images as you like to each astronomical object.